This is the first in a series of reports predicting dairy innovation rollouts in 2017. As the year starts to wind down, food and beverage market analysts issue forecasts for macro trends that will drive innovation. I take those trends and combine them with the knowledge gained throughout the year from attending international trade shows and talking with suppliers and dairy foods marketers. This year the entire dairy foods supply chain is pumped up about the future. And this is thanks to all the dedicated people who work in every link, from farm to table. The GDP states that dairy’s story is about an industry that has created millions of jobs and has the capability to sustain and revitalize rural communities in all corners of the world. It’s about a quest to help children thrive, communities grow and generations build upon responsible land stewardship. World economic, financial and food crises contribute to make dairy’s tale one of food security and producing nutritious food, both safely and sustainably. Since its inception, GDP has worked to promote the nutrient richness of dairy products, bring balance and research to the role of milkfat in the diet and provide clarity on how dairy is managing its relationship with the environment. Now more than ever, as the world’s population increases by 75 million people per year, the time is right to tell the story of dairy’s power as a sustaining life force, as well as the dairy goodness we bring to billions of people every day. Well stated. Now here are the five trends to guide your product development efforts in the dairy-based beverage sector. 1. Clean, Simple Labels. One of the reasons milk and dairy-based beverages are popular with today’s consumers is their lack of “stuff” that consumers just don’t want in their foods. While many food and beverage products are challenging to simplify and clean up, it is pretty straightforward with milk and dairy-based beverages. Use only natural flavors and colors. When building mouthfeel or keeping flavors and colors in suspension, opt for stabilizing systems recognized as natural. Dairy proteins are one of your best choices. It’s putting dairy back into dairy, and giving consumers more of what they are looking for in the diet. That’s protein. 2. Protein, Fat, the Whole Package. Speaking of protein, I’ve been hearing there is some concern in the nutritional community that a growing number of protein-obsessed consumers are taking in so much protein that they are now not getting enough of other essential nutrients. That’s where dairy-based beverages come out a leader among all protein sources. The protein is inherent, as is the fat, and fat is back. Make your new beverage innovations either low-fat or even full-fat. Add extra high-quality, complete whey protein for function and nutrition. Talk about the protein and the fat, and how the latter contains essential fatty acids necessary for growth and body function. Dairy-based beverages are also an ideal vehicle for many important nutrients and functional compounds, namely prebiotic fibers and probiotic cultures. These beverages can also be formulated to contain fruits and vegetables, foods most consumers are lacking in their diet. Only dairy-based beverages can deliver all of this in one package. The time is right to do this, simply and powerfully, and to communicate the story to the consumer. 3. Package. That’s right, the package. Fresh from attending Pack Expo, I can tell you there’s a great deal of opportunity to differentiate in the beverage sector with packaging. It’s time to invest. The flexible beverage package was the star at Pack Expo. Multi-serve flexible packages have been catching on the past few years in Europe for products such as coffee cream. 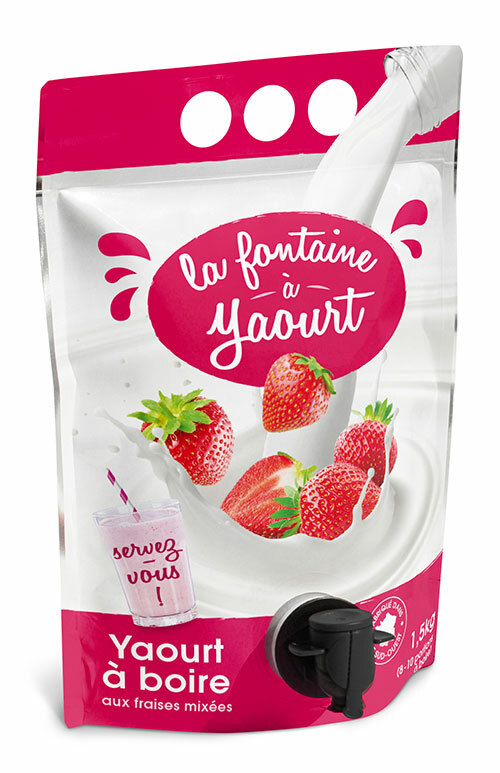 This year at SIAL, Sodiaal was a SIAL Innovation Awards finalist for its Yeo Fontaine a Yaourt. This is a 1.5-liter flexible stand-up pouch with spout to keep beverages on tap. 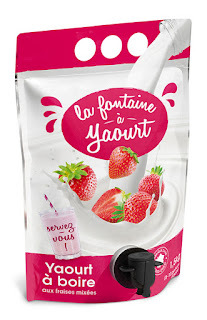 This is yogurt, but it can be flavored milk, a dairy-based protein beverage or some other innovative dairy concept. This package was generically on display throughout Pack Expo. And, why not bag-in-a-box flavored milk? Here’s something to consider regarding an investment in single-serve pouch technology. Though most adults today may not be comfortable eating or drinking from a single-serve pouch package. That will change, and no, it’s not millennial driven. It’s Gen Z. This population grew up with pouches. Many were seldom fed baby food from a jar. They were given a pouch and sucked away. It is a different oral sensation, and even a different way of tasting, but none the less, something this demographic knows and is comfortable with. Single-serve pouches are a great way to deliver a powerful, viscous dairy food that Gen Z will embrace in their early adult life and beyond. 4. Early Adult Life and Beyond. The concept of foods and beverages formulated for specific life stages—beyond baby, toddler and pre-teen--is finally catching on in the U.S. It’s been an active area for some time in Asia and in select countries throughout Europe. At SIAL, there were dairy-based beverages for moms and moms-to-be, for nursing moms and the moms of moms (grandmothers). There were dairy-based protein drinks for athletes and seniors, and for energy and stress. 5. Flavors. I cannot emphasize enough the importance of including limited-edition and seasonal flavors in your milk and dairy-based beverage mix. You want to be in coffee- and tea-based beverages, too. Cold-brew coffee, as a latte and straight up, is being made by everyone, including breweries and corner cafes. Now’s the time to offer your milk in this beverage format. Give it a whimsical name. Tell a story. According to Sterling-Rice Group’s top-10 culinary trends for 2017, “Wake and Cake” will be big. This is consumers having their cake and eating it for breakfast. With recent science and research endorsing this diet strategy, in the year ahead SRG expects more people to partake in this decadent post-breakfast trend. Why not give it to them in a dairy-based beverage. Think crème brulee or cheesecake flavored whole milk protein smoothies. There’s a lot of unknowns in our near future. Hopefully this forecast helps your business thrive in 2017 and beyond.